Iceland is a lovely place for those who have some leisure. There are lots of things to do. Plenty of theatres, concerts, swimming-pools, golf courses and what have you. You may go shopping for the fun of it and have a cup of espresso, or perhaps you prefer to take a stroll in the countryside. Well, here are some of the things we recommend personally. One of the best things about living in Iceland (and having some leisure!) is how close you are to the nature: marvelous landscapes, unique volcanic areas, and great panoramic hiking trails. The trip to Thingvellir (below, Flosagjá) is an unforgettable experience. This is one of the places where you can stand with one foot on the European continental plate, the other resting gingerly on the American one. 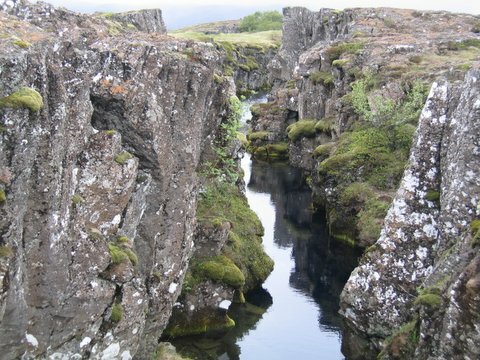 If you are diving the golden circle, anyway, you should stop and take a look at Kerid. That is fantastic. If you love nature, there are plenty of hikes to choose from. We recommend a hike that will lead you to Glymur, in the Hvalfjörður area. If you are driving from Reykjavík north to Akureyri, you might want to go out of your way to visit Húsafell, a jewel surrounded by glaciers, once you have passed Borgarnes. Further north there is the wild and stark Strandir area, renowned for witchcraft and spooks. It is certainly worth visiting, at least in broad summer light. Further north and east there are several noteworthy sites such as Asbyrgi and Dettifoss, one of the country's most powerful waterfalls. Akureyri, the capital of the north, is beautiful, but Reykjavík is a very special city as well. It spreads over a wide area along the Faxaflói coast, surrounded by mountains and sea. However, the Lake remains one of its most emblematic sites. Reykjavík has acquired some kind of reputation for its wild night-life, There are nice day-time hikes to be made there as well. Esja is the Reykjavik mountain. The nearby Reykjanes peninsula is picturesque, full of unforgettable hiking trails, natural wonders and surprises. There is also Keilir, the pyramid mountain and of course Hveragerdi. However, if if this is too cold for you, maybe Jamaica is something for you, or even Hawiian?